Beautiful photos can really make a WordPress blog pop. The problem? A single 5MB photo can grind the page speed to a halt. Resizing and compressing each photo individually takes too much time. Being able to compress large blog photos automatically as they are uploaded will save you tons of time. It will also dramatically improve your WordPress load time! There is only one plugin I turn to for automatically resizing images, Imsanity. 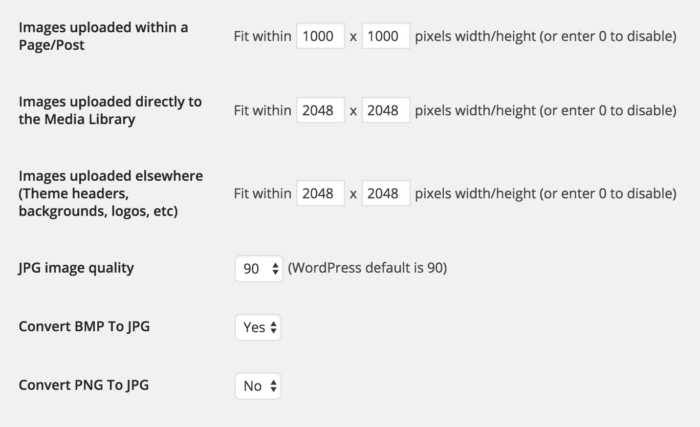 By default, images are resized to 2048×20148 pixels while being uploaded into WordPress. You can change these sizes and when the images should be resized. For example, you can specify 1000×1000 for images uploaded to a post while images uploaded directly to the media gallery can be much larger. It is dead simple to use and free on the WordPress repository. We have the suite of WPMU plugins so we utilize the WP Smush plugin for clients. The combination of Imsanity and WP Smush is incredibly effective. The best part is clients don’t need to do a thing! It just works!